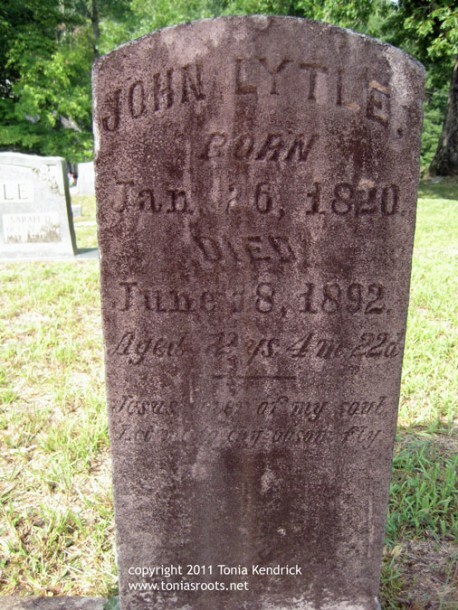 John Lytle was born 26 Jan 1820 in Burke County, North Carolina. He died 18 Jun 1892 and is buried at Bethel UMC-Old Cherry Springs Cemetery in Old Fort, North Carolina. John was the son of George Lytle and Susannah Clark and a grandson of Captain Thomas Lytle and Susannah Perkins. He married another Lytle-Perkins grandchild, his first cousin, Lizzie Lytle, the daughter of Millington Lytle and Polly Potillo. Martha Lytle, yet another Lytle-Perkins grandchild and first cousin to both John and Lizzie, was my third great-grandmother.